Background: Leukemic stem cells (LSCs) are thought to originate either from normal hematopoietic stem cells or from more differentiated progenitor cells. LSCs are capable of self-renewal, proliferation, and differentiation into malignant blasts. Objective: To evaluate the expression of the LSC markers CD96 and CD123 in de novo acute myeloid leukemia (AML) patients, and to explore the relationship between those markers and response to induction therapy and prognostic factors in AML. Materials and Methods: A cross-sectional study was conducted on 30 adults with newly diagnosed AML patients were prospectively tested for the expression of CD96 and CD123 using four-color flow cytometer at the time of diagnosis and re-evaluated at day 28 from the start of chemotherapy for the response to 3 + 7 induction therapy regimen. Results: Eight cases (26.7%) expressed CD96, and 12 cases (40%) expressed CD123; all the CD96 positive cases were also CD123 positive, however, four cases among the CD123 positive patients did not express CD96. CD96 and CD123 were expressed more on blast cells in the cases of M5 French-American-British subtype, whereas the least expression was in M3. Among the eight cases with CD96+ expression, only (37.5%) acquired CR, whereas cases without CD96 expression, (77.3%) acquired CR. Among the 12 cases with CD123+ expression, only (33.3%) acquired CR, while cases without CD123 expression, (88.9%) acquired CR. Conclusion: The expressions of CD96 and CD123 were associated with a higher total white blood cell count and bone marrow blast cells at presentation, and a lower response rate to the induction therapy. For all patients with AML, PB, and BM aspirate samples were repeated at day 28 from the start of chemotherapy to assess the CR, for AML M3 patients BM repeated only after recovery of PB hematological parameters. Thirty adult newly diagnosed AML patients were enrolled in the study; the mean age was 41.33 ± 16.58 years (mean ± SD); the range was 16-75 years. The highest incidence was reported at the age group 25-34 years while lowest at ≥65 years. AML was observed more in males than in females with male:female ratio of 1.3:1. The mean of total WBC count at presentation was 40.3 ± 59.83 × 10 9 /L (mean ± SD), ranged from (1.5-234 × 10 9 /L) and median was 15.4 × 10 9 /L. Patients were divided into three groups according to the counts of WBCs: Leukopenia (<4 × 10 9 /L), normal (4-10 × 10 9 /L), and leukocytosis (>10 × 10 9 /L). Accordingly, seven patients (23.3%) were leukopenic, seven patients (23.3%) had normal WBC count, whereas 16 patients (53.4%) which represent the majority of cases had leukocytosis [Table 1]. The mean of hemoglobin (Hb) concentration was 8.49 ± 2.66 g/dl (mean ± SD), the range was 3.96-15.3 g/dl and median was 7.99 g/dl. Only two patients (6.7%) had a normal Hb concentration. The mean platelet count was 60.41 ± 38.82 × 10 9 /L (mean ± SD) and the range was 6.6-146 × 10 9 /L. 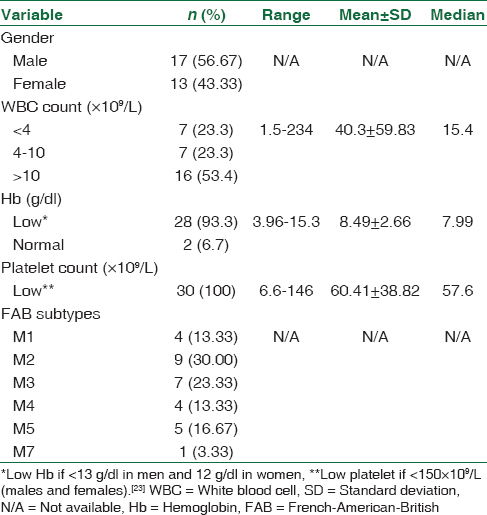 The median was 57.6 × 10 9 /L, all patients (100%) had low platelet counts [Table 1]. French-American-British (FAB) M2 formed the major portion of AML subtypes (30.00%), followed by M3 (23.33%) and M5 (16.67%) then M1 and M4 (13.33% for each) and M7 was (3.33%), M0 and M6 subtypes were not represented in the current study [Table 1]. CD96 was expressed in 8/30 patients (26.7%), for CD123 expression, 12/30 patients (40%) had positive expressions. All CD96 positive cases were also CD123 positive, however, four cases among the CD123 positive patients didn't express CD96 [Figure 1]. CD96 was expressed more in M5 subtype cases, while not expressed in M3 subtypes. CD123 was expressed more in M5 subtype cases, while expression was poor in M3 [Table 2]. Regarding hematological parameters, the total WBC count and BM blast cells percentage of AML patients with CD96 and CD123 expression were significantly higher than those without markers expression, while there was no significant correlation between PB blast cells percentage, Hb level and platelet count with the CD96 and CD123 expression [Table 3]a, b, [Table 4]a and b.
CR was achieved in 20/30 patients (66.67%) at the end of induction therapy. Among the eight cases with CD96+ expression, only three cases (37.5%) acquired CR and five cases (62.5%) have no remission. On the other hand, among the 22 cases without CD96 expression, 17 cases (77.3%) acquired CR and only five cases (22.7%) have no remission. Out of the 12 cases with CD123+ expression, only four cases (33.3%) acquired CR and eight cases (66.7%) have no remission. While among the 18 cases without CD123 expression, 16 cases (88.9%) acquired CR and only two cases (11.1%) have no remission, and these results appeared that there was a significant correlation between positive expressions of CD96 and CD123 with the nonresponsiveness to induction therapy [Table 5]. The percentage of CD96+ expression cases was comparable to that found by Gramatzki et al.,  Zhao et al.,  and Du et al.,  but lower than that done by Hosen et al. The total WBC count of AML patients with CD96 expression was significantly higher than those without this expression and this result was comparable to result documented by Zhao et al., 2013. The present work did not reveal any significant differences in CD96+ expression with respect to the PB blasts percentage. However, CD96 expression was significantly associated with BM blasts percentage. To the best of our knowledge, no previous studies addressed the correlation of the PB blasts and BM blasts percentage with CD96 expression, interestingly in 2015, a study done on patients with myelodysplastic syndrome by Zhang et al., revealed that the expression levels of CD96 and CD123 were significantly correlated with the proportion of the BM blasts. Regarding CD96 expression distribution among FAB subgroups, it showed that the high percentage of CD96+ observed in M5 subtype, while CD96 is not expressed in M3 subtype and these results were in agreement with Zhao et al.,  however, previous study done by Gramatzki et al., showed that CD96 expression is rare in M5 subtype. Among the eight cases with CD96+ expression, only three cases (37.5%) acquired CR, while among the 22 cases without CD96 expression, 17 cases (77.3%) acquired CR. Current results were consistent with that of Zhao et al., 2013  and Du et al., 2015  who found that CD96+ expression was associated with a lower rate of CR in AML patients. The total WBC count of AML patients with CD123+ expression was significantly higher than those without this expression. Similar results were documented by several previous studies. ,,, The present work did not reveal any significant differences in CD123+ expressions with respect to the PB blasts percentage, whereas it was significantly associated with BM blasts percentage. The same results had been documented by Farweez et al.,  and Khorshed et al. Regarding CD123 expression distribution among FAB subgroups, it showed that highest percentage of CD123+ observed in M5 subtype, while the least expression was in M3 and these results were in agreement with Zhao et al. Among the 12 cases with CD123 expression, only four cases (33.3%) acquired CR, while among the 18 cases without CD123 expression, 16 cases (88.9%) acquired CR and these results were similar to that found by Zhao et al., 2013,  Farweez et al., 2015  and Ge et al., 2014  who found that CD123 expression was associated with a reduced response to induction chemotherapy. Liesveld JL, Lichtman MA. Acute myelogenous leukemia. In: Lichtman MA, Kipps TJ, Seligsohn U, Kaushansky K, Prchal JT, editors. Williams Hematology. 8 th ed. China: The McGraw-Hill Companies, Inc.; 2010. p. 1277-330. Iraqi Cancer Registry: Leukemia Statistic of the Year 2009. Minstry of Health/Iraqi Cancer Board; 2011. Hussein SH. Survey of Adult de novo Acute Myeloid Cases Reported in the Medical City in Baghdad Through the Years (2005-2011). A Thesis Submitted to the Department of Pathology and Forensic Medicine in partial fulfillment of Master of Science Degree in Hematology: College of Medicine-Baghdad University; 2013. Jordan CT. The leukemic stem cell. Best Pract Res Clin Haematol 2007;20:13-8. Buss EC, Ho AD. Leukemia stem cells. Int J Cancer 2011;129:2328-36. Ho AD, Wagner W. Bone marrow niche and leukemia. Ernst Schering Found Symp Proc 2006;5:125-39.
van Lochem EG, van der Velden VH, Wind HK, te Marvelde JG, Westerdaal NA, van Dongen JJ. Immunophenotypic differentiation patterns of normal hematopoiesis in human bone marrow: Reference patterns for age-related changes and disease-induced shifts. Cytometry B Clin Cytom 2004;60:1-13. Kussick SJ, Wood BL. Using 4-color flow cytometry to identify abnormal myeloid populations. Arch Pathol Lab Med 2003;127:1140-7. Krause DS, Fackler MJ, Civin CI, May WS. CD34: Structure, biology, and clinical utility. Blood 1996;87:1-13. Nielsen JS, McNagny KM. Novel functions of the CD34 family. J Cell Sci 2008;121(Pt 22):3683-92. Junghanss C, Waak M, Knopp A, Kleine HD, Kundt G, Leithäuser M, et al. Multivariate analyses of prognostic factors in acute myeloid leukemia: Relevance of cytogenetic abnormalities and CD34 expression. Neoplasma 2005;52:402-10. Gramatzki M, Ludwig WD, Burger R, Moos P, Rohwer P, Grünert C, et al. Antibodies TC-12 ("unique") and TH-111 (CD96) characterize T-cell acute lymphoblastic leukemia and a subgroup of acute myeloid leukemia. Exp Hematol 1998;26:1209-14. Hosen N, Park CY, Tatsumi N, Oji Y, Sugiyama H, Gramatzki M, et al. CD96 is a leukemic stem cell-specific marker in human acute myeloid leukemia. Proc Natl Acad Sci U S A 2007;104:11008-13. Testa U, Pelosi E, Frankel A. CD 123 is a membrane biomarker and a therapeutic target in hematologic malignancies. Biomark Res 2014;2:4. Sun Q, Woodcock JM, Rapoport A, Stomski FC, Korpelainen EI, Bagley CJ, et al. Monoclonal antibody 7G3 recognizes the N-terminal domain of the human interleukin-3 (IL-3) receptor alpha-chain and functions as a specific IL-3 receptor antagonist. Blood 1996;87:83-92. Testa U, Riccioni R, Militi S, Coccia E, Stellacci E, Samoggia P, et al. Elevated expression of IL-3Ralpha in acute myelogenous leukemia is associated with enhanced blast proliferation, increased cellularity, and poor prognosis. Blood 2002;100:2980-8. Zhao M, Zhu H, Sajin R, Xiao X, Deng Q. Clinical significance of leukemia stem cells immunophenotype expression in patients with acute leukemia. Life Sci J 2013;10:2544-8. Farweez BA, Hashem AE, Elsalakawy WA. Leukemia stem cell markers: CD 123 and CD25 are poor prognostic markers in adult acute myeloid leukemia patients. Int J Adv Res 2015;3:136-47. Dombert H, editor. Optimal Acute Myeloid Leukaemia Therapy in 2012 Haematology Education: The Education Program for the Annual Congress of the European Haematology Association; 2012. Kotiah SD. Acute Promyelocytic Leukemia Treatment Protocols: WebMD LLC; 2014. Available from: http://www.emedicine.medscape.com/article/2005126-overview. [Last updated on 2015 Dec 30]. Döhner H, Estey EH, Amadori S, Appelbaum FR, Büchner T, Burnett AK, et al. Diagnosis and management of acute myeloid leukemia in adults: Recommendations from an international expert panel, on behalf of the European LeukemiaNet. Blood 2010;115:453-74. Elliott AC, Woodward WA. Statistical Analysis Quick Reference Guidebook: With SPSS Examples. California: Sage Publication; 2007. Bates I, Lewis SM. Reference ranges and normal values. In: Bain BJ, Bates I, Laffan MA, Lewis SM, editors. Dacie and Lewis Practical Haematology. UK: Elsevier Limited; 2011. p. 11-22. Al-Mohsen FS. Identification of Leukemic Stem Cells in Acute Myeloid Leukemia by Flow Cytometry and its Correlation with Response to Induction Therapy. A Thesis Submitted to the Department of Pathology and Forensic Medicine in Partial Fulfillment of Master of Science Degree in Hematology: College of Medicine -Al Nahrain University; 2013. Al-Hemedawee NS. Evaluation of the Aberrant Expression of CD56 and CD2 in Newly Diagnosed Adult Acute Myeloid Leukaemia. A Thesis Submitted to the Scientific Council of Pathology in Partial Fulfillment of Requirements for the Degree of Fellowship of the Iraqi Board for Medical Specialization in Pathology/Hematology; 2014. Mohammed RS. Expression of CD13 and CD33 in de novo Adult Acute Myeloid Leukaemia and Their Clinical Relevance A Thesis Submitted to the Scientific Council of Pathology in Partial Fulfillment for the Requirements for the Degree of Fellowship of the Iraqi Committee for Medical Specializations in Pathology/Haematology; 2014. Legrand O, Perrot JY, Baudard M, Cordier A, Lautier R, Simonin G, et al. The immunophenotype of 177 adults with acute myeloid leukemia: Proposal of a prognostic score. Blood 2000;96:870-7. Dawood SD. Assessment of IL-6 serum level in patients with acute myeloid leukemia. Iraqi J Cancer Med Genet 2011;4:22-8. AL-Husseiny AH. Acute myeloid leikemia in adolescent and adult Iraqi patients. Diala J 2008;29:353-62. Alwan AF, Zedan ZJ, Salman OS. Acute myeloid leukemia: Clinical features and follow-up of 115 Iraqi patients admitted to Baghdad Teaching Hospital. Tikrit Med J 2009;15:1-8. Mele A, Stazi MA, Pulsoni A, Visani G, Monarca B, Castelli G, et al. Epidemiology of acute promyelocytic leukemia. Haematologica 1995;80:405-8. DU W, Hu Y, Lu C, Li J, Liu W, He Y, et al. Cluster of differentiation 96 as a leukemia stem cell-specific marker and a factor for prognosis evaluation in leukemia. Mol Clin Oncol 2015;3:833-8. Zhang W, Shao Z, Fu R, Wang H, Li L, Liu H. Expressions of CD96 and CD123 in bone marrow cells of patients with myelodysplastic syndromes. Clin Lab 2015;61:1429-34. Zhu HB, Zhao MF, Li YM. Relationship between the expression of leukemia stem cell immunophenotype and the treatment efficacy and prognosis. Zhonghua Xue Ye Xue Za Zhi 2012;33:58-60. Ge F, Li B, Gao X, Ren Y, Liu H, Su B, et al. Immuno-phenotypes and prognosis of acute leukemia in elderly patients. Int J Clin Exp Med 2014;7:3714-8. Khorshed A, Elsharkawy N, Elrefaey FM, Elgamal B. Interleukin-3 receptor alpha chain as a unique marker for leukemic stem cells in acute myeloid leukemia. Life Sci J 2011;8:68-7.